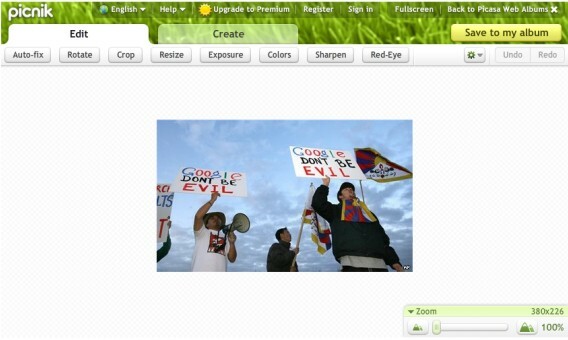 Why do you think Picnik would be faster in HTML 5? I haven't seen any applications that are faster in HTML 5 than in Flash (I could be wrong). Picnik is a powerful application. I don't know that re-writing it would be a big speed bump. "I expect that Picnik will be rewritten as an HTML5 application"
Just like Youtube prefers Flash to HTML5, the same is for Picasa. For now Flash is better at doing image processing than HTML5, and don't expect that a HTML5 application loads quicker than a similar in flash too. I like H5 too, but it is jut a bit too early. Darkroom looks nice and it doesn't use Flash. Yes, looks nice. Performs well on my old pc too. I like that PicasaWeb is catching-up to flickr; if I weren't so googly I'd probably be using flickr more. HTML5 would be nice, but more importantly would be integration with more printing services. In particular PNI Media - which does Walmart & Costco among others - would be the ultimate enhancement, and don't forget us Canucks up north! Just let the developer's mind to think about rewriting the code. But I'm prefer HTML5. 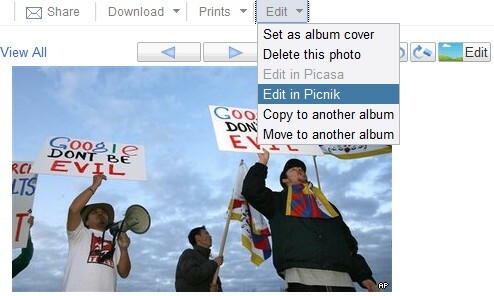 Now that Google had integrated Picnik into Picasa, how the Flickr-Picnik partnership play out? 1. After the recent bad publicity over Street view cars, I don’t think they would risk another but of bad publicity. However, I also expect that Picasa, with its “native” integration with Picnik, would enjoy a greater set of features from Picnik, compared to Flickr. Any chance Picnik edits can be automatically synced back to your local machine's Picasa? ...and to keep a record of the update and the potential to undo it locally.